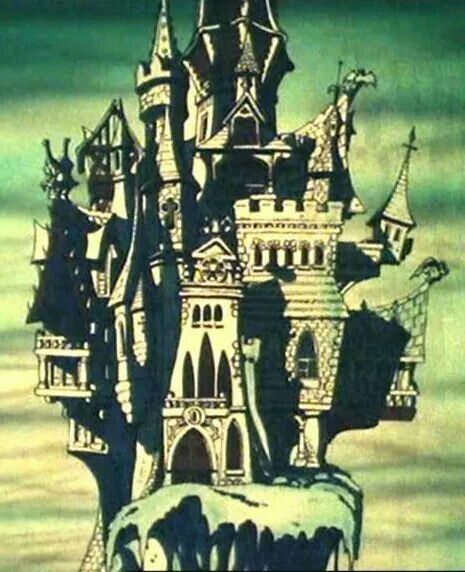 Castle Duckula is Count Duckula's ancestral home and where he resides and usually scheme to become the most famous. Castle Duckula, as best described by Penfold, is a big and scary castle. While not as big as it's previous incarnation, this Castle Duckula is pretty large and seems to be lit by nothing more than torches. Despite this the castle does have electricity as Count Duckula was able to run a TV show from it's living room and has a giant TV set up on his balcony and smaller ones set up in the castles dungeons, though it appears the castle doesn't have WiFi as Duckula had to go to a cafe in 'half the world is not enough' and use their WiFi to use his laptop. Also unlike it's previous incarnation, this Castle Duckula seems well kept and fairly stable, though this could be contributed to the lack of Nannies breaking through walls and such, that castle Duckula always seemed to be minutes away from imploding upon it's self. Though this version of Castle Duckula does have pictures of Count Duckula's all over the walls, like the previous one, though the pictures are those of the modern day Duckula only (to further prove he's a egomaniac) and a big framed picture of the 17th Count Duckula from the titular character's previous show and the castle also appears to have stained glass windows also featuring the 17th Count Duckula. Castle Duckula first debut with Duckula in 'From Duck to Dawn' when in Transylvania, Danger Mouse (correctly) suspected it to be were the broadcast that was hypnotizing everyone was coming from while Penfold was scared to go up there as it was big and scary. D.M. and Penfold so enter to find themselves Face to Beak with the Count Duckula , who gracefully sits them down and interview them for his talk-show, which D.M. informs Duckula that's he's well known all over the world, which upsets Duckula who no longer want's to be the most famous Transylvanian but now the most famous duck ever. He then throws Danger Mouse and Penfold into the castles dungeons but not before getting the car keys from Penfold. D.M. and Penfold do eventually free themselves and the prisoners from the dungeon, but not before D.M. inadvertently insults them all and chase him and Penfold to the balcony. where they find that Count Duckula has hooked up the Danger Car's revolutionary fusion reactor to a T.V. satellite to broadcast his show's all over the world and was preforming, but soon the group of angry prisoners arrive and instead of attacking the duck that enslaved them they choose to throw the mouse who made one side comment about them off castle duckula and to his essential death. Danger Mouse obviously survives by using his lazer shoe strings as helicopter blades and uses them to put an end to Duckula's broadcast. When confronted by Danger Mouse, Count Duckula transforms into a carrot and flee's the castle. It appears that the castle has stain glass windows with the 17th Count Duckula on them.